'O.J. 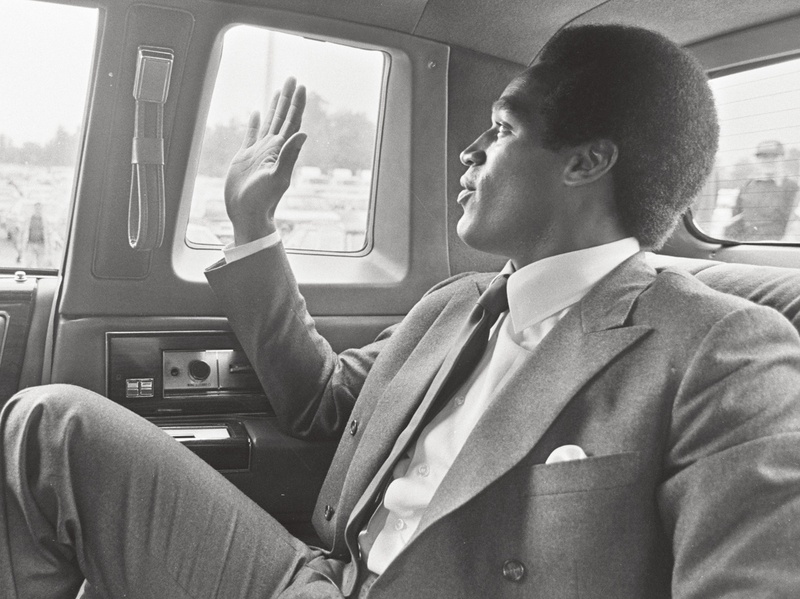 : Made In America': Series Considers 'Perfect Perversity Of O.J. Simpson Case "He was acquitted of the crime he was guilty of and convicted of a crime he's innocent of," says legal analyst Jeffrey Toobin. He and director Ezra Edelman discuss O.J. : Made in America. O.J. Simpson returns to Rich Stadium for his induction into the Buffalo Bills Wall of Fame in 1980. Hall-of-Fame football player O.J. Simpson is currently serving a 33-year prison sentence in Nevada for a 2008 conviction for armed robbery and kidnapping — a sentence legal analyst Jeffrey Toobin calls "totally bogus." "It's the perfect perversity of the O.J. Simpson case that he was acquitted of the crime he was guilty of and convicted of a crime he's innocent of," Toobin tells Fresh Air's Dave Davies. The crime that Simpson was acquitted of is the 1994 murder of his ex-wife, Nicole Brown Simpson, and her friend Ron Goldman. Toobin covered the trial for The New Yorker and later wrote about it in his 1996 book, The Run of His Life: The People vs. O.J. Simpson. 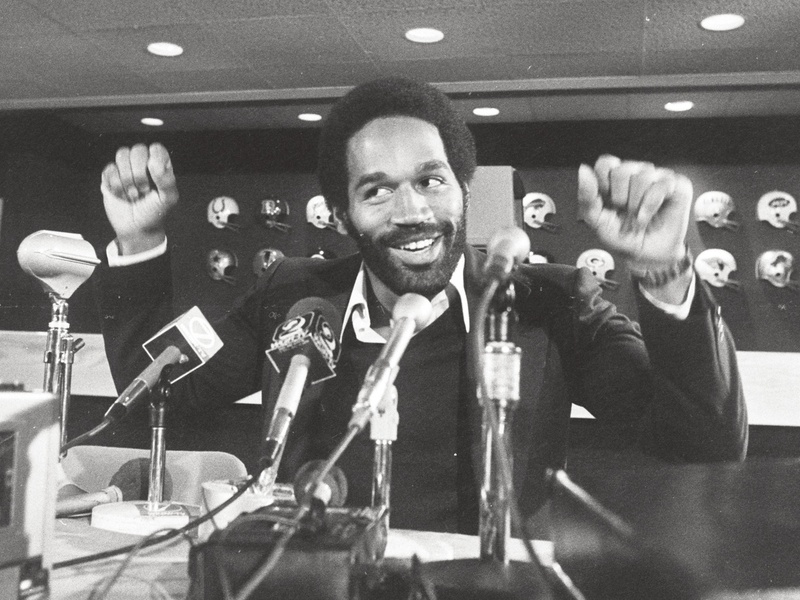 Now director Ezra Edelman revisits Simpson's fall from grace in ESPN's new five-part documentary series, O.J. : Made in America. The film weaves together interviews with a number of key figures, including Toobin, prosecutor Marcia Clark and Los Angeles police detective Mark Fuhrman, and examines Simpson's rise to fame and eventual acquittal for murder through the prism of Los Angeles' long-simmering racial, class-based and gender politics. Simpson's rise to fame ran parallel to the city's 1965 Watts Riots, a fact that director Edelman says helps explain the complexities of his story. "O.J. Simpson, a black kid from Potrero Hill — the projects in San Francisco — what he had to do to become recognized was run a football," Edelman says. "Concurrent to that, however many miles south in California, you had a whole neighborhood community of people who burned down their community to get recognized. ... When you look at O.J. and you start to sort of see how he rose to fame and went up through the world, it really starts there in that juxtaposition." On the racial tension in Los Angeles. Jeffrey Toobin: The history of Los Angeles is a history of real racial struggle, and I think because Los Angeles is not the South, because Los Angeles is famous for Hollywood and beaches and good times, I think people outside who didn't grow up there and didn't study it have not realized just how painful the racial history of Los Angeles has been, and particularly the relationship between the Los Angeles Police Department and African-Americans. Yes, people have seen the nine-second clip of the Rodney King beating, which became so infamous, but if you look at who [LAPD] Chief [William] Parker was, and where L.A. cops were recruited from and what their relationship was like with the hundreds of thousands of African-Americans who lived in this city, that's the necessary preamble for the O.J. Simpson case, and it's part of what Ezra explores so brilliantly in this documentary. Simpson speaks at a press conference, circa 1975. Ezra Edelman: There was this group of black athletes who were increasingly militant, political, most famously obviously, Muhammad Ali, who in June of 1967 refused induction into the Vietnam War. So it's that climate in which O.J. came to prominence, and when O.J. was approached by the end of 1967 by a guy named Harry Edwards, who was a sociologist and an activist and a professor at San Jose State, he had organized something called the Olympic Project for Human Rights, where he really wanted black athletes at the time to be closer aligned to the civil rights movement, to the struggle, and he approached O.J. to be a part of it. 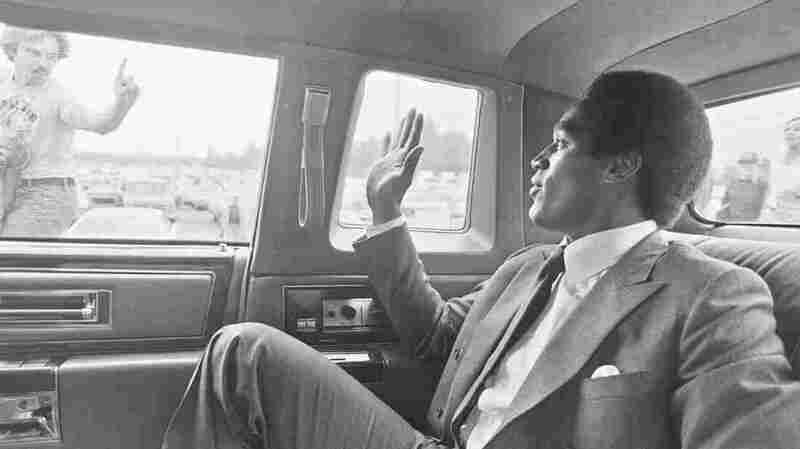 He wanted athletes to boycott the '68 [Olympic] games in Mexico City, and when O.J. was approached — O.J. was also a track star at the time, not just a football star — O.J. 's response famously was, "I'm not black. I'm O.J." Now, what O.J. really was saying was, Look, I have an ambition for myself. I'm looking to be famous, I'm looking to be rich, and I'm looking to be loved by everyone. And being political, being outspoken and seeing the way America at that time responded to people like Ali, like Jim Brown, like Bill Russell, these were scary figures, culturally. And so I think O.J. knew that to get what he wanted to get, he couldn't be that. He was going to blaze his own trail and that's what he did. Before he'd even play ... in the NFL, there he was on TV, hawking Chevrolets and RC Cola. He chose a different path, and that path was followed by the likes of Michael Jordan and Tiger Woods. Edelman: David LeBon was one of Nicole's best friends from growing up. He met her when she was a teenager down in Dana Point in Orange County, and when Nicole graduated high school she moved to Los Angeles and moved in with David LeBon — platonically, they were just friends — and David LeBon was a photographer at the time. Within a couple months of living there she got a job as a waitress at this hot restaurant/club called The Daisy, where a lot of stars hung out, and within the first few weeks of being there, O.J. walked in one day and saw this 18-year-old, beautiful, blond girl and remarked to a friend of his, "I'm going to marry that girl." She came home and told David LeBon who she had met, and David LeBon of course was like, "I know O.J. Simpson." And they went out on a date and she came home, David LeBon was almost like a concerned parent — he was more of an older brother figure in her life — he said that she came home and her jeans were ripped and that according to David LeBon, that O.J. had been a little forceful with her. David asked her, "Why would you have let him do that?" and all she said was, "Don't be mad, Dave, I really like this guy." And that was the beginning of it. It's a terrible story to hear, especially where you know this story is going. Toobin: I would say two reasons: One was domestic violence was simply not taken as seriously by the police as it is today. These were considered largely personal matters; it was not really the concern of law enforcement. It was just societally perceived in a very different way. The second point is that O.J. Simpson got special treatment because he was a celebrity. Especially in light of how the trial unfolded, one of the many crazy ironies of this whole case is that the Los Angeles Police Department — far from conspiring to get O.J. Simpson — had been conspiring to protect O.J. Simpson from arrest for domestic violence for years. Edelman: We have an interview with O.J's former agent, Mike Gilbert, who is someone who worked closely beside O.J. for six or seven years before the murders and stuck by him for 11 or 12 years afterwards, and he tells a story about visiting O.J. in jail. He had gone and visited almost every day in jail, because he was somebody who was responsible for helping generate money through the sale of memorabilia, so O.J. would sign cards and jerseys and things while in jail, and that helped fund his defense efforts. During one of these conversations, O.J. expressed reservations about trying on the gloves [in court]. He really didn't want to. And according to Mike Gilbert, Mike just said, "Hey, why don't you just maybe not try to take your arthritis medicine for a couple weeks." O.J. looked at him kind of quizzically and he says, "But what? What would that do?" And then the lightbulb went off and he thought, Oh, hands would swell up, wouldn't be able to bend his knuckles, glove maybe wouldn't fit the same way. So according to Mike Gilbert, that's what happened. You had motive, you had opportunity, you had physical evidence, and it is an outrage to this day that O.J. Simpson was not convicted of these two murders. Toobin: There was enough evidence for a jury to convict this guy seven times over. People talk about reasonable doubt as if it's some unclimbable mountain. You know what? Our prisons are full, and every single person in there either was convicted under that standard, or pled guilty because they knew they'd be convicted, and when you look at the volume of physical evidence against a man who, by the way, was a convicted domestic violence abuser against the initial victim in this case, so you had everything in this case. You had motive, you had opportunity, you had physical evidence, and it is an outrage to this day that O.J. Simpson was not convicted of these two murders. You can't look at O.J. Simpson the same way, because ... in terms of the circus that the trial became, the people — Nicole Brown Simpson and Ronald Goldman — in many ways, were forgotten. I think just to sort of see the savagery of those crimes is very important as an audience to understand why we were here in the first place, why we're telling this story. For anyone who wants to, sort of, give O.J. a pass in some very strange way — no, I challenge you to be able to look at those photos and then look at him the same way. Toobin: I don't think he would've even been prosecuted [in 2008] had he not been O.J. Simpson. I think as someone who is supposed to believe in the criminal justice system that it's an outrage he's in prison at all for that crime. ... I don't stay up at night feeling terrible about the injustice, but it was a bogus case from top to bottom and the sentence was insane. Edelman: He's up for parole next year. Toobin: He's also, I believe, 68 years old now. There are not a lot of 68-year-olds still in prison. I mean, they do tend to let people out, and as far as I'm aware, his record has been clean in prison. So I do think he will get out at some point, if not next year, then sometime relatively soon.